I first started to use the principles of Hugo’s Body Re-Engineering in August 2011.I had just qualified as a Fitness Instructor/Personal Trainer and although I knew the basics of training, I had no idea of how to approach a competition. Thus, I started to use the BRE principles and also its UOA support system. 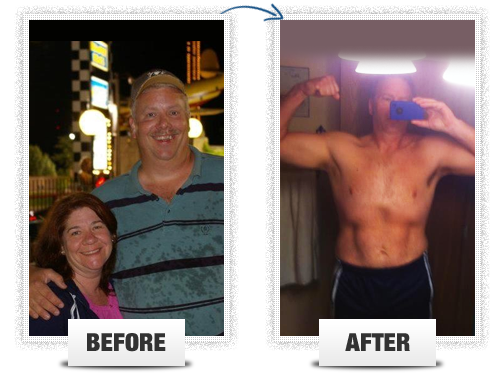 Using the support system to the fullest along with the Body Re-Engineering principles completely changed my body and my life! Inside the BRE support system, I immediately bonded with Cecile (one of the coaches that work with Hugo) who was very friendly and helpful and was also preparing herself for a competition in Florida which was a day apart from mine and so she was able to take me with her on the competition journey 🙂 At only 8 weeks out, there was much work to do, however, under Cecile’s guidance (and using the BRE principles to the fullest extent modified for competition) I lost 10lbs of bodyfat, my body changed shape and my muscle tone increased. 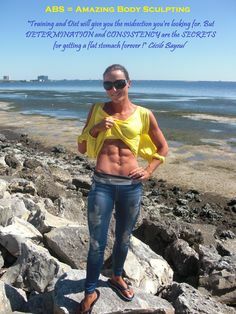 The training and diet were tough, however when I seen the results of the hard work, it helped push me forward to continue to follow Cecile’s plan. I knew I was in good hands and this lady knew her stuff 🙂 I competed at the beginning of October 2011, and placed 3rd out of 3. I cannot describe how much confidence I gained from being on stage and having Cecile for support every step of the way!! I had caught the bug! Another competition was scheduled for April 2012 and I set my eyes on it! I used Cecile’s plan from the first competition and stayed in contact with her throughout 10 weeks of dieting to make sure I was on the right track. Again, she guided me all the way and this time I placed a solid 3rd place out of 7! I was delighted! I cannot thank Cecile enough for her help, support and friendship! Competing changed my life and I am now preparing for my next show I would recommend anyone to get the Body Re-Engineering System and to also take full advantage of its Member’s Support area as doing so completely altered the way that I look and feel. I am a fitness instructor of several years, and despite countless attempts of advice from my own supervisors I found Hugo. . I started with the Body Sculpting Workout #2 and was able to see results in the first 6 weeks. 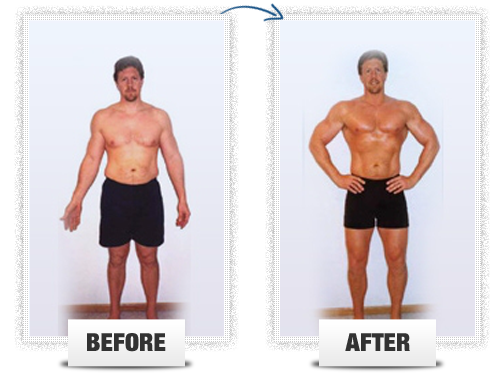 I have continued the program several times over and have graduated on to the Body Definition Workout.. When I started I was 130lbs. and had 24% body fat. I now weigh 105lbs. and have 11% body fat and I have maintained that very easily just by doing what I have learned in the book. Not only have I experienced great success with it, it has been a useful research tool for my job. For many years I tried many systems on and off, but only got marginal results, which left me frustrated, and as a result, I would stop doing them. Last year, when I decided to really get back in shape, I contacted my friend Hugo and he referred me to his Body -Re-Engineering system. 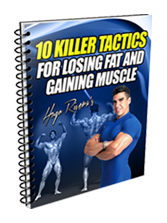 As soon as I started to do the Body Re-Engineering workouts and diet, I noticed that I was not only building massive muscles but started to lose body fat at a super accelerated rate! This kept me motivated and as a result I stuck to the system. This system just blows everything else away! I gained over 25 lbs of Rock Solid Muscle and lost over 35 lbs of fat. In addition, these are permanent results and I just keep getting better and better. Nothing can compare to this and I can tell you that I’ve tried just about everything else out there. Regards, Samuel Santos. It takes time, it takes effort, it takes getting educated, and it takes a willingness to look at your skeletons, but it’s all WORTH it… and YOU are worth it! Everything in life is a choice — you choose what you want, where you will go, and how you will get there — and ultimately it is you who will choose to change your life! You CAN do this, and you’ve got great support on Hugo’s University of Abs support site to help you along the way! As far as motivation goes, initially I wanted to get in shape in order to defeat the diabetes and get off of the meds. My doctor explained that it was possible but that most people usually have to take them (the meds) the rest of their lives so not to worry about it too much and try to lose a little weight if you can. It was that possibility that gave me the desire to lose the weight and get off of the meds and get healthy. I really had a wake up call so to speak. Now my desire is to get cut and bigger by next summer when my oldest daughter is getting married. It might take another year, or even two, but I am determined. Probably one the best things about using your system is the level of confidence that I now have. I am more confident in my personal life, my professional life, and my kids lives. I notice that people look at me differently. They don’t see the big fat guy any more. My friends and co-workers talk to me and treat me differently somehow. There is a certain level of respect that I now experience that I did not have in the past, even from my boss. I am not sure exactly how to explain it, but it is there. AND I LIKE IT! Hugo, thanks for all of your wisdom. Talk to you soon. I first came across Hugo 2 years ago . I was chubby as a kid and a young teenager until i was about 15 that’s when i started to care about my looks and appearance and its the age girls start to notice you so I was very determined to get rid of the fat (which I did) but as a result i went really skinny and was eating very little and the food I was eating was not healthy food even though I was happy. At the time I realized that I had gone too skinny (weighing only 9 stone) and needed to put some muscle on, which is what the girls seemed to like on a boy, which was another reason (along with being healthy) that motivated me. I trained with weights for around 2 years but even though I put on muscle and strength (every one does when they first start) my diet and training were very poor and I stopped putting on any muscle or strength for over a year. I knew I had the determination but i just needed the right guidance and knowledge so at age 18, I came across Hugo’s system and little did I know this was about to change not just my bodybuilding but life forever! After going through the whole system I started to use it and I had amazing results! After my first bulk cycle I got to 15 and half stone and put on a lot of muscle and strength (by the way, this is all natural) which was amazing! 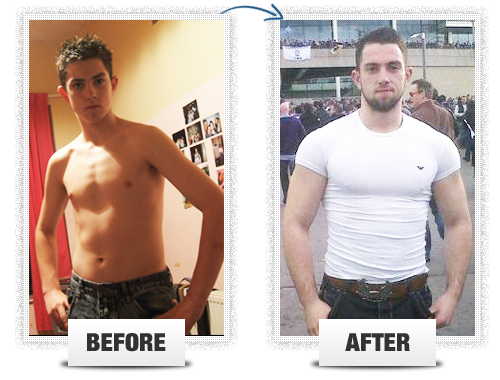 I am now aged 20 and weigh a lean 14 stone (around 8 percent body fat) and the knowledge and advice Hugo has given me over the years through his Body Re-Engineering membership site will not be forgotten. I am so grateful ! The massive point which made me take a shine to Hugo was that hes a natural bodybuilder because if he wasn’t I might not have been so keen to look into his materia. 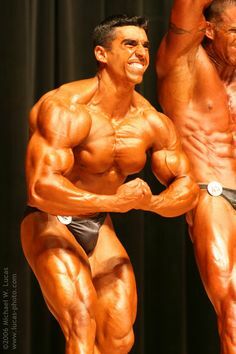 The fact that he’s a natural bodybuilder (and also in amazing shape) is great to connect to young people starting off bodybuilding and turn them in the right direction. 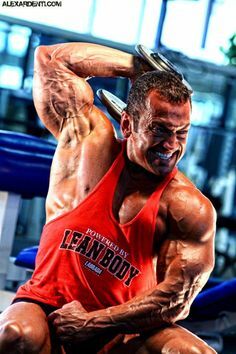 I know a few people who live where I do who have gone to the wrong gyms and been influenced by the wrong men who were convinced to take steroids at early ages such as 15. Lucky for me I was never interested one bit in stuff like that. 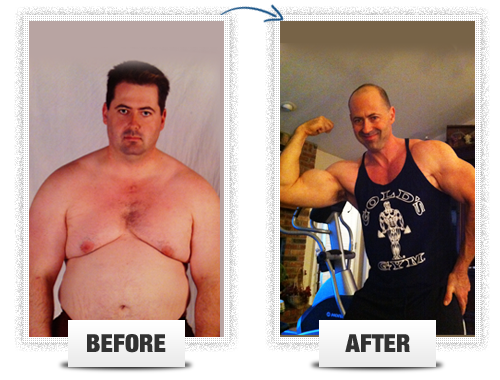 I knew I could do it naturally with hard work and Hugo represents everything that is good about bodybuilding. He always made time to reply to my problems and give me advice on bodybuilding.Hugo is also an amazing human being; he is a top guy in the industry and yet he’s very humble. He wants to give all his knowledge to us and influence us in the right manner preventing us from making all of the mistakes he made at the beginning. I can say that using Hugo’s principles has not only changed me physically for the better but mentally as well! The mental boost you get from looking and feeling good with compliments of people is really good. 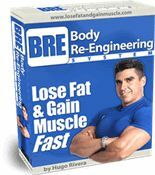 I’d strongly recommend his Book Re-Engineering along with the Body Re-Engineering University of Abs support site. Thanks Hugo and keep up the good work! 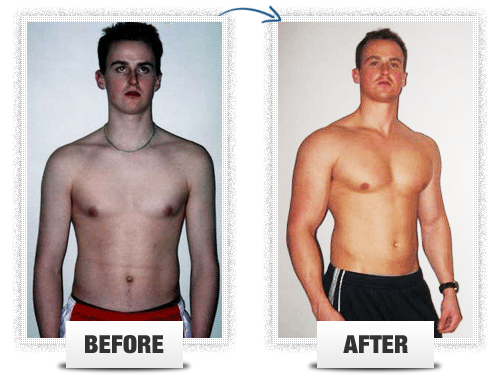 Hi Hugo, I just wanted to give you a little feedback on how your natural bodybuilding exercise/nutrition program has helped me. I started following your program in late Febuary of (2002) and have lost approximately 30 pounds and added some significant size. My body fat percentage is now around 12.5%. I have a couple of recent photos that I took as part of a 30-day rapid-results fitness competition. I just submitted my photos and other information so I’m not sure how I did yet but following your program certainly helped me get the results I wanted. Here’s the before and after pictures after 30 days. I’m now trying to get under 10% body fat and get some additional size. I’m even thinking about trying a competition for the over 40 crowd (I turn 40 next March). Just so you know, I’m 6′-3″, 215 lbs. I have known Hugo for over 5 years and followed his career in bodybuilding for even longer. He continues to impresses me on so many levels: from his vast knowledge in health and nutrition, to his easy to understandable delivery, his infectious motivation but also his personal adversities which he has overcome. He has emerged to become a leader in the industry. I am so proud to know him and I believe in him from the bottom of my heart. Hugo Rivera is an author, all natural bodybuilder has his own regular television slot, and he practices what he preaches,(the guys in top shape.) 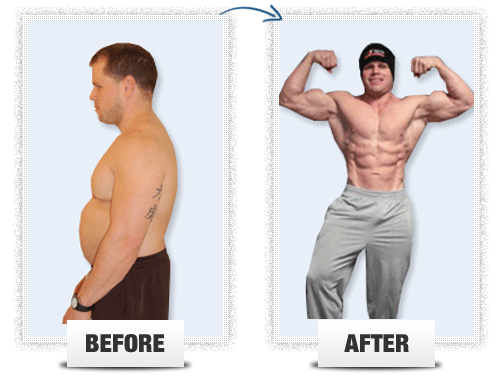 But all that aside, I like what he has to say,his approach is the common sense application of scientifically proven methods.The fact that he has used his system to achieve his physique despite being both very skinny due to an anorexic period in his life and also very overweight as a child has allowed him to create a system that works for overweight people and the skinny guys as well.